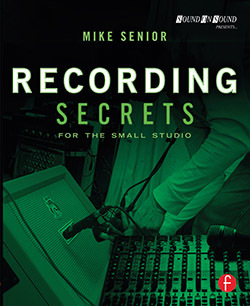 The following audio examples were recorded with session bass player Markus Braun in a spacious, wooded-floored performance space with a generous (and pleasant-sounding) room reverb. The microphones used were Avantone CK1 small-diaphragm condensers and Superlux R102 ribbons, preamplified via an Audient ASP008 multi-channel microphone preamp and recorded digitally without any signal processing. A Radial Engineering Pro 48 DI box was also fed from the instrument's bridge pickup system and recorded alongside the microphone recordings, so you can experiment with how it combines in practice. This microphone setup used five Avantone CK1 microphones (with their cardioid capsules) and three Superlux R102 ribbon microphones (with figure-eight pickup by nature) to record the vertical dispersion of an acoustic bass, for both plucked and bowed performance techniques. A DI signal was also captured simultaneously. 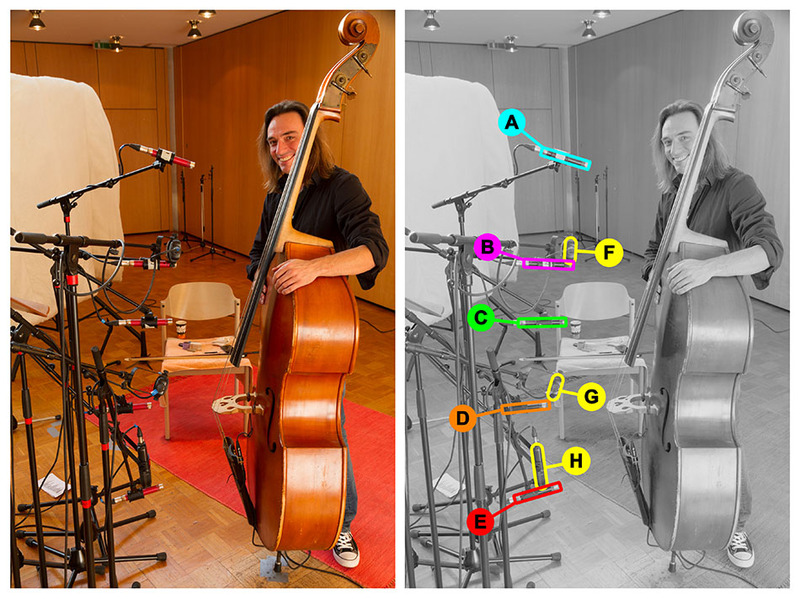 Vertical Dispersion At Different Angles/Distances: For the first set of audio examples, the vertical array of eight mics (five condensers and three ribbons) were set up around 25cm away from the front of the instrument, directly on-axis to its centre line (ie. the tailpiece, bridge, and fingerboard), as shown in the picture. Then, with the bass spike remaining in the same position, the instrument was rotated about 30 degrees off-axis to the array in both directions to generate a further two sets of audio files. Finally, the on-axis instrument position was repeated, but at a distance of around 50cm, generating the fourth set of files. 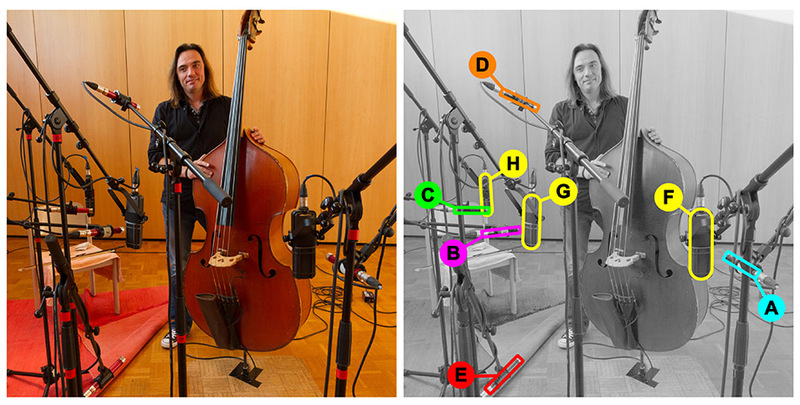 This microphone setup used three Avantone CK1 microphones (with their cardioid capsules) and three Superlux R102 ribbon microphones (with figure-eight pickup by nature) to record the horizontal dispersion of an acoustic bass, for both plucked and bowed performance techniques. In addition, a further two CK1s were set up in lower and higher positions to relate the audio examples better to those in Multimic Setup 1. Again, a DI signal was also captured simultaneously. Horizontal & Vertical Dispersion: For this set of audio examples, the condenser microphones were set up in a cross-shaped formation, with all mics pointing inwards towards the instrument from a distance of around 60cm. The three ribbon microphones were set up alongside each of the horizontal trio of condensers. Mics B, D, E, and G were all directly on-axis to the instrument's centre line (ie. the tailpiece, bridge, and fingerboard); Mics A and F were around 40 degrees off-axis to the player's left; and Mics C and H were around 40 degrees off-axis to the player's right.